Many people turn to LASIK surgery because they would like to improve their vision. The procedure is very technical and complex and can be difficult to understand. This guide will help you to better understand how LASIK surgery is performed. Each eye is unique and comprised of many different elements. The different parts of the eye work together to enable a person to have vision. Vision problems are commonly caused by a problem known as a refractive error. This happens when the cornea and the eye are not perfectly shaped causing the image that is reflected on to the retina to be blurry and out of focus. 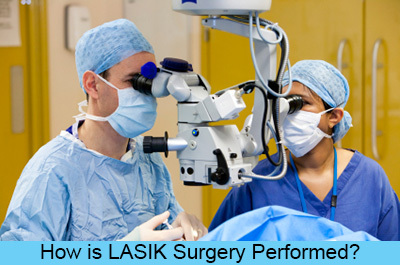 During LASIK surgery, tissue from the cornea is removed. Reshaping the cornea can result in improved vision by increasing the eye’s ability to focus images. Getting ready for a LASIK procedure is fairly simple. Generally you will meet a doctor before the procedure to determine if you are a good candidate for surgery. At this time the doctor will assess your medical history, your eyes and your expectations for the procedure. They will also take several measurements of your eyes to determine what type of reshaping is needed. Once you are approved for surgery a time will be selected for the procedure. It is generally recommended that you avoid wearing contact lenses for a few days to weeks before undergoing LASIK. Wearing contacts temporarily changes the shape of the eye and can interfere with your results. Depending on if you have been wearing soft or rigid contact lenses, the doctor will recommend a time frame that you should not wear your contact lenses prior to surgery. Generally, it will be 3 days for soft contacts and anywhere from weeks to months with rigid contacts. You should also avoid using lotions, creams, makeups and perfumes before surgery. An antibiotic eye drop will be prescribed to use twice a day 3 days prior to surgery for prophylactic purposes. LASIK surgery procedure is relatively quick. Most people are in and out of surgery in about 20-30 minutes. The procedure is usually completed in your doctor’s office in a special room that houses the complex laser that is used. Patients will lie on their backs in a reclining chair. A numbing eye drop is then used to temporarily numb the cornea during the procedure. The area around the eye is cleaned and the eye is held open using a speculum. A small flap will be cut in the cornea to allow for reshaping. This is done either using a mechanical device (known as a microkeratome) or it can be done with a specialized laser. Your doctor will be able to tell you which device they will use during your procedure. If the mechanical microkeratome is used, patients often report feeling some pressure on the eye during this procedure. A ring is placed on the eye and pressure is applied to suction the ring to the eye’s surface. Some patients find this part of the surgery uncomfortable. A small cutting device is attached to the ring and the blade is used to cut the cornea. If laser is used the cornea is flattened using a clear plastic plate. Patients report feeling pressure and discomfort during this part of the procedure. A laser is then used to create bubbles of gas and water underneath the cornea’s tissue. These bubbles cause the tissue to separate and create a flap. Once the flap is created it is folded back and the tissue underneath is dried. You will be asked to focus your vision on a bright light. This will ensure that your eye is in the correct position for reshaping. The laser will then reshape the cornea by burning the unnecessary tissue. Many people smell a burning smell, similar to burning hair. The cuts are typically made automatically using a computer program that cuts according to the eye measurements taken at your initial exam. The flap is then put back in place and a shield will be placed over the eye. Stitches are not used and the shield will ensure that the flap remains in place while it heals. Rubbing your eye can cause the flap to move and must be avoided. Your doctor will also give you instructions about other activities to avoid during the healing process. Eye drops will be prescribed to prevent infection and to decrease inflammation to be used for a few days post surgery. Most people recover fairly quickly from LASIK surgery and can resume most regular activities just a day or two after surgery. Some pain or discomfort is common, but will typically fade with time. It can take three to six months for vision to completely stabilize after a LASIK procedure. But majority of people can see 20/20 on their 1 day follow up appointment.